A visitor to Galapagos partakes of an extraordinary visual feast. Galapagos is home to some of the most unusual life forms in the world. There are 13 main oceanic islands, situated 600 miles to the west of the eastern coast of continental Ecuador. Their remoteness has led to the evolution of many unique qualities in the flora and fauna that abound on this isolated archipelago. The islands straddle the equator and are volcanic in origin. In fact, Galapagos is one of the most seismically active regions on the face of the globe. 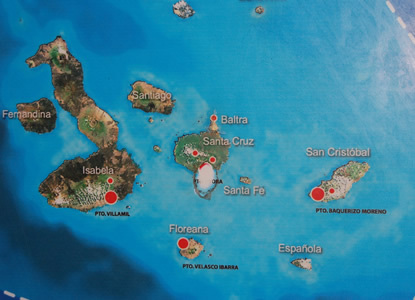 The oldest islands of San Cristobal and Espanola were formed over 13 million years ago by hot spots spewing forth massive rivers of volcanic magma. Although the Islands are astride the equator, the water, although often crystal clear for snorkeling, is quite cold. The Islands are influenced by four different currents from the north and south Pacific assuring perennial cool water and an abundance of fish. Tourism is significantly limited and controlled by the Ecuadorian government. Only 96 ships are licensed to tour the islands and visits to each island are regulated as to time and duration. During our ocean adventure, we never saw more than one ship each day besides our own. This was Candy’s and my second trip to Galapagos. Approximately 11 years ago, we spent three days in Galapagos with our three children. We decided three days was not enough time to see the extraordinary variety of plants and animals and geological features on this amazing archipelago. In December, 2007 we returned for a weeklong cruise aboard the Eclipse, a well-appointed, 210-foot ship with capacity for 48 guests. We visited seven of the 13 main islands, including Batra, Isabella, Floreana, Fernandina, Santa Cruz, Espanola, and San Cristobal. We saw creatures that are found nowhere else on earth. Darwin visited these islands on his famous voyage on the Beagle and in 1856 published his revolutionary Origin of Species laying the foundation for much of our modern day concepts of evolution. Darwin’s observation of the survival of the fittest is evident throughout Galapagos. Most of the animals came to the island through treacherous seaways floating on rafts of tree branches and only the strongest and most adaptable survived the brutal forces of nature. For example, land iguanas, looking like multi-colored miniature dinosaurs, in order to survive, over the millennia have transformed into marine iguanas able to survive both on land and to dive up to 30 feet in water to feast on algae. The interplay of ocean currents from the northern Pacific and the southern Pacific provided for the immigration and ultimate evolution of the California Sea Lion from the north and Galapagos Penguins from the south. The Galapagos Sea Lion populates many of the islands beaches. The alpha-males preside over harems with more than ten females. The females give birth to one pup each year and for the first 2 years of their life, the pups do nothing but frolic with their buddies. Many of the pups just paddled up to us and nuzzled close as though all they wanted was to have us join them in their play. The Galapagos Penguins were amazing swimmers and we saw them frequently together with Spotted Eagle Rays, Manta Rays, Galapagos Sea Lions, Pacific Green Sea Turtles, Stone Fish, and the exotic 300 pound Pacific sun fish (the Mola Mola) while snorkeling in these cold, crystal clear blue waters. While we were snorkeling, the Sea Lions would play games with us bolting right up to us and then diving under our feet and somersaulting underneath us like expert gymnasts and then immediately repeating their antics. They brought the concept of having fun in the water to a new level. Kayaking along the islands, we spotted hundreds of blue-footed boobies along the craggy volcanic outcroppings. Watching flocks of hundreds of them dive down straight into the crashing waves as they gathered food for their young was an inspiring spectacle. Nazca Boobies and their chicks were abundant as well. We learned that Nazca Boobies hatch two eggs, but that the first born chick pushes the second newborn out of the nest under the watchful eye of the mother and only the stronger first born will survive. Lacing the volcanic rocks along the shoreline were brilliant red Sally Lightfoot Crabs with their turquoise underbellies. The Darwin Research Center is on the main island of Santa Cruz situated in the Galapagos National Park. This is the island which has a substantial human as well as giant tortoise population. At the Research Center, giant tortoises are bred and we saw the famous “Lonesome George,” the last of his particular species, who has had great difficulty finding a partner with which to mate. We took a hike along the highlands of Santa Cruz Island and came upon well over 50 giant tortoises, which can weigh as much as 700 pounds and live for as long as 150 years. and the Greater Flamingos, which migrated from the Caribbean Islands. On our final day we saw the magnificent Waved Albatross in flight. The Albatross can live up to 50 years and unlike many of the other birds and animal species we observed, they are monogamous and pair for life. We were fortunate enough to be able to see mating pairs in their graceful courtship dance. The Waved Albatross has a 7-foot wing span, and when they take off, it is like watching an overloaded Boeing 747 waddle up to the runway and then leap into the air. Once airborne, they forage for more than 2,000 miles to obtain food for their young, which learn to fly at about six months of age. The memories of these islands and their indelible visual images will stay with me forever. I have visited the islands two times and that simply is not enough. I look forward to a return visit and to islands which continue to remain pristine in their splendid isolation.